KUALA LUMPUR: Datuk Seri Najib Abdul Razak and his wife Datin Seri Rosmah Mansor are suing PKR vice president Mohd Rafizi Ramli and an online news portal owner for allegedly defaming them over a speech made in relation to the removal of oil subsidies. They said that Mohd Rafizi had delivered a slanderous speech against them at a forum in Bandar Tun Razak on Nov 22 last year on issues relating to oil subsidies. Najib, who is also Prime Minister, said that the PKR secretary-general had uttered offending words in respect of his office, while Rosmah said his words implied she had committed a criminal act. They said that the recording of the speech was uploaded by Chan Chee Kong onto Media Rakyat’s website, YouTube channel, and Facebook page. Chan is the sole proprietor of MR Multimedia, the owner of online news portal Mediarakyat. When contacted, the couple’s lead counsel Datuk Mohd Hafarizam Harun said his clients filed the civil suit to vindicate them from the vilification and vicious attacks of late by certain Opposition leaders. “Whilst my clients accept constructive criticism in politics and issues, defamatory remarks are not acceptable. Let the court decide,” said Mohd Hafarizam. In the suit, Najib said that the statement implied he had unlawfully stolen the people’s monies in connection with the removal of oil subsidies for personal gain. Among others, Najib said that he was portrayed as a person guilty of theft and corruption, was untrustworthy and unfit to hold public office. 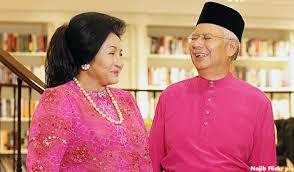 Rosmah said that the words implied she unlawfully benefited from the people’s monies allegedly stolen by her husband. They claimed that this had caused them to suffer public scandal, odium and contempt by friends, acquaintances and the public both, locally and internationally, and that Mohd Rafizi’s statements had caused damage to their reputations. The two plaintiffs said that Chan had failed to exercise responsible journalism by taking steps to verify the truth of the allegations before republishing the speech. They said Mohd Rafizi, as an opposition politician, published the words maliciously knowing them to be false and with reckless disregard as to their veracity. Najib and Rosmah said that they sent a letter of demand dated Dec 4 last year through their solicitors for the defendants stop making further defamatory statements against them, and wanted an apology, a retraction and a written undertaking that they would refrain from publishing such words as well as compensation, but they failed to accede to their request. In the statement of claim, they are seeking general damages, aggravated and exemplary, for slander and libel. In the claim filed on Wednesday, made available to the media Friday, they are also asking the court to assess general damages, aggravated and exemplary, against Chan for libel. The couple also applying for an apology and injunction to restrain both defendants from publishing further defamatory statements against them. They also want that Chan to remove the recording from Mediarakyat’s website, YouTube page and Facebook page with immediate effect from the date of judgment.